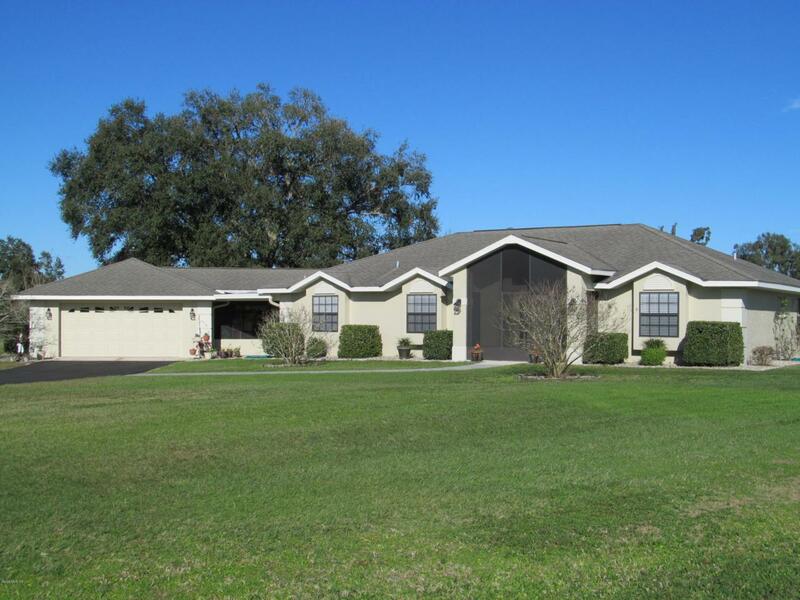 This picturesque and well maintained farm is located centrally between Gainesville and Ocala. Close access to I-75 and minutes to HITS, Golden Ocala and the new World Equestrian Center. Solar powered front gate allows access to the property. As you drive down the paved driveway, there are wonderful views all around you, especially the pond bordered by bald cypress trees. This natural landscape attracts an abundance of wildlife including a large variety of bird life from bald eagles to hummingbirds. This would be a great place to bring your horses or livestock. This property is fenced with water access to all current andpreviously existing paddocks. There is a 14 stall shed-row barn (2 stalls temporarily converted to equipment storage) and includes a tack room, wash bay, and electric available for hot walker in front of barn. The home has been updated over the years to include updated kitchen and bathrooms with granite countertops. The flooring is primarily tile with wood laminate in the bedrooms and sunroom. In 2018 the HVAC and the well pump and casing pipe were replaced and the driveway was repaved. See attached list detailing all improvements. Front parcel has a separate well, septic and electric for an additional residence possibility and includes a storage barn. The adjacent 21.61 acres to the west are available for sale if interested in additional acreage. The parcel is fenced, cleared pasture, wooded area at the back, has a stand of long leaf pine trees on the western border and separate well. This property is offered at: $288000. See MLS# 548606 for listing including all parcels. Listing provided courtesy of Lesley Ellen Rogan of Right-Time Realty, Llc.